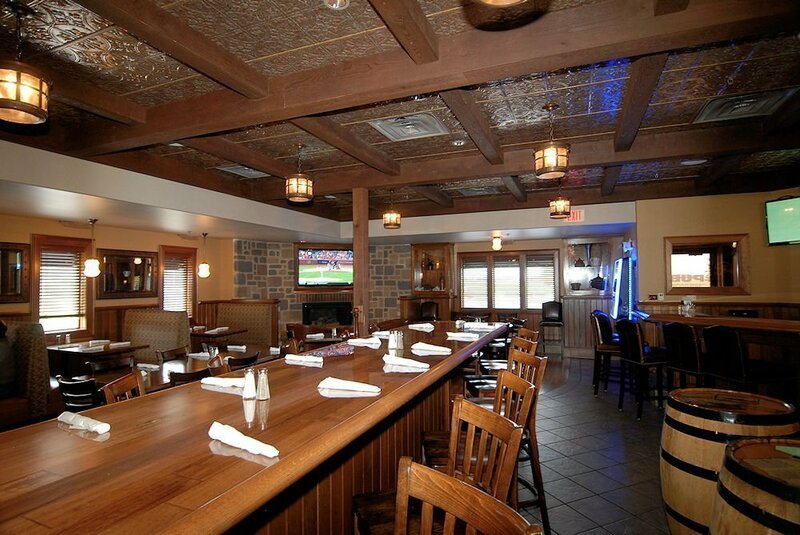 Hammerworks Old World Tudor Style Hanging Light OWH1 Shown At Millhurst Ale House Yorkville ILL.
Hammerwoks Old English Tudor Hanging Light Fixture OWH1 brings a rugged old world style to a broad range of applications. 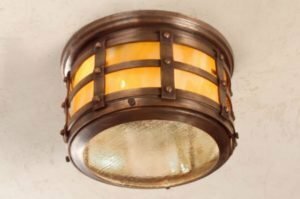 Most importantly these handcrafted heavy gauge copper fixtures from our Olde English Tudor Lighting collection complete a bold rustic look in both interior and exterior settings. Especially relevant the OWH is made with your choice of either an open or closed bottom. Furthermore they coordinate perfectly with the Tudor Style Ceiling Copper Light OWC1. Thus if you have an are with limited height clearance you have a matching option. Either way their sturdy looks work well to provide primitive charm to a grand mountain lodge, log cabin or Adirondack home. Hammerworks is proud to offer a complete selection of matching Olde English Tudor Lighting. 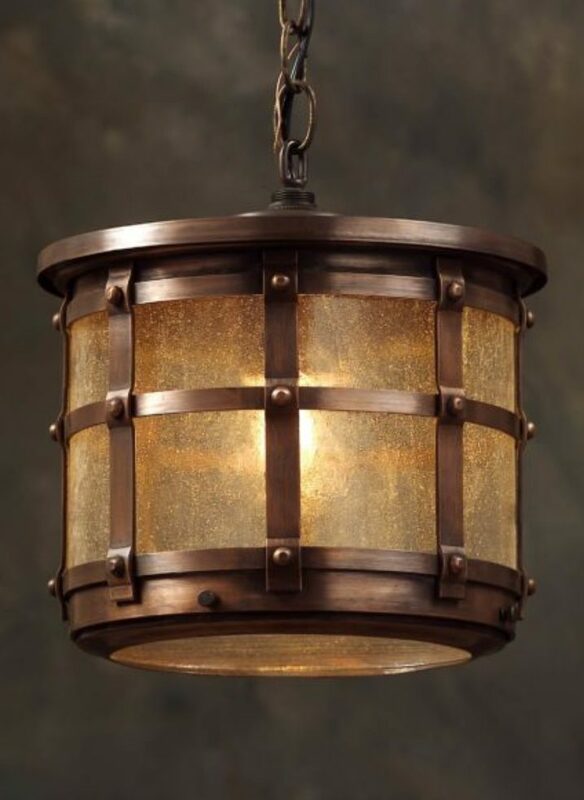 The English Tudor Copper Wall Lantern OWW1 is available in 3 sizes & styles. Furthermore we also make 2 sizes of the Tudor Style Copper Post Lantern OWP1. While these Old World lights echo the look of historic times, they make a bold statement in many settings. Thus commercial buildings, lobbies, hallways and foyers as well as large kitchens and great rooms are enhanced by the size, simple shape and character of these handcrafted copper fixtures. Finally the hand hammered heavy copper construction of these extraordinary lights will impress the most discriminating buyer. Our Old English Tudor Chandeliers & Wall Sconces give you a look unparalleled in the lighting industry. First of all the strong yet seemingly simple shape of the Tudor Style Copper Chandelier CH421 stands out in any setting. Yet the hand applied rivets and hammered copper surface provides detail and texture demanding a closer look. Furthermore the graceful half round shape of the coordinating English Tudor Wall Sconce S143A mirrors the strong simple lines of the chandeliers. In addition the Tudor Style Wall Sconces S144 with their arrowhead shape offers a look that is uniquely “American”. The design adds special charm & character to any room especially in suited to log homes, lodges and other rustic settings.